Yogyakarta- Tuesday, October 10th 2018 The Master of Science and Doctorate Program, Faculty of Economics and Business, Gadjah Mada University (MD FEB-UGM) held a public defence. Dr. Dyah Ekaari Sekar Jatiningsih, SE., M.Sc. 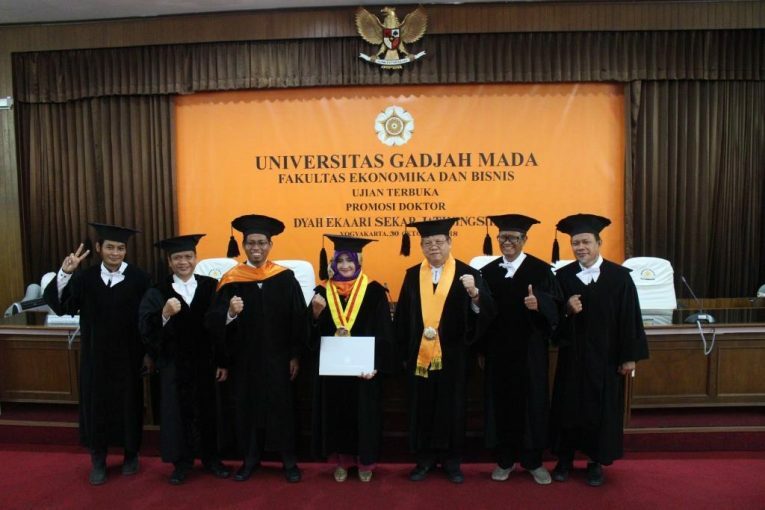 who is one of the FEB UGM Accounting Doctoral students officially holds the title of Doctor. Dr. Dyah Ekaari Sekar Jatiningsih, SE., M.Si. dissertation entitled “The Effect of Task Characteristics and Graphic Presentation Formats with Statistical Models on Judgment Quality: Testing Theory of Cognitive Conformity” promoted by Prof. Dr. Mahfud Sholihin, M.Acc and co-promoter Supriyadi, M.Sc., Ph.D and Ertambang Nahartyo, M.Sc., Ph.D., CMA. The public defence was led by Prof. Jogiyanto Hartono M., Ph.D, and members Prof. Dr. RA Supriyono, S.U., and Prof. Dr. Abdul Hamid Habbe, M.Sc. The dissertation results of Dr. Dyah Ekaari Sekar Jatiningsih, SE., M.Si. in accordance with the theory used in research that shows that there is cognitive conformity between the graphical presentation of information and tasks that must be completed by individuals based on that information can improve quality judgment and decisions. The judgment based on graphic information about the cost of a damaged product and two other cost that is useful for determining estimates accurately. Suggestions proposed to management based on the results of this study relate to the organizational planning stage. For complex task functions in organizational functions, management needs to consider the suitability of the tasks and information presented.